Married couples' retirement plans may be among their most valuable and complicated assets. Appraising plan values correctly for a fair division at divorce is a challenge many attorneys do not feel qualified to undertake. This overview of retirement plans will give attorneys a deeper understanding of clients' assets. A married couple's retirement plans are often among the most valuable assets the couple has, comparable to the equity in the spouses' residence if they own their home. If they divorce, it is usually an easy matter to obtain a fair appraisal of the home. But a retirement plan is more complicated than real estate, and appraising its value correctly and dividing that asset fairly between divorcing spouses can be a challenge. By using the offset method, under which the marital portion of retirement benefits is appraised and used to offset other assets in the couple's property division. Each way of dividing benefit plan rights has pros, cons, and challenges for divorcing couples and the attorneys, judges, and mediators who must guide them through the financial confusion of divorce. The QDRO Method. A QDRO directs a retirement plan administrator to pay benefits to the plan member's ex-spouse, who is referred to as the QDRO's alternate payee. A well-designed QDRO can guarantee that the alternate payee will receive the share of marital benefits that the court intended – regardless of unforeseen events such as the plan member's untimely death before any benefits become payable. A sound QDRO document will apportion the benefits in an appropriate way, will have death benefit protection built in, and may address other contingencies as well to ensure that the QDRO performs as expected. Lawyers who work on divorces that involve QDROs have been magnets for malpractice suits, because a poorly designed QDRO can be a real disaster. Lawyers who are not experienced with them should consider hiring consultants to help write appropriate QDROs, especially in cases in which a standard QDRO offered by a retirement plan either seems unsafe to use or does not meet clients' particular needs. Delegating a QDRO's design and drafting to a qualified specialist not only reduces an attorney's exposure to liability but also often has another advantage: a good QDRO specialist knows how to tailor a QDRO to meet the requirements of a difficult case. The Offset Method. The offset method's main disadvantage is that it requires a price tag to be put on a benefit that is contingently payable – if A occurs, the benefit will prove to be valuable, whereas if B occurs, the benefit will be almost worthless. This requires lawyers to rely on an actuary's or other expert's opinion of the benefit's "expected" (average) future value. Even when actuarial valuations are good estimates of average benefit values, they often prove to be poor estimates of benefit values in individual cases. In a divorce, use of an actuarial appraisal of a benefit may result in one spouse receiving a windfall at the expense of the other. Some people believe that a third advantage is that the offset method allows a couple to settle the matter of dividing a pension at the time of their divorce, rather than deferring the matter. A simple buyout by the plan-member spouse of the other spouse's share of benefits has more of a feeling of finality to it than a QDRO would. However, QDROs also settle matters in "real time": they divide marital benefits at the time of divorce by establishing a legally binding document at that time, not in the future. The fact that future benefits under a QDRO may be subject to uncertain future events is equally true of a retirement plan's benefits left intact by using the offset method. In either case, only time will tell the amount of benefits that will be paid and to whom. This article focuses on the valuation of pensions for the purpose of applying the offset method in Wisconsin divorces. The article first looks at Wisconsin's law regarding division of retirement benefits and discusses the nature of typical retirement plans. The article then looks at the impact of actuarial assumptions on benefit valuations and discusses how this information applies to valuations of Wisconsin Retirement System (WRS) benefits. In Wisconsin, as in every other state, case law determines how to define, measure, and divide pension rights in a divorce. There are six determinations that must be made for the proper valuation of marital pensions in any state. 1) The "Date of Classification" or "Cutoff Date." This date represents the time after which state law considers that a divorcing couple can no longer acquire marital property. This may be either a) the date the couple separated, b) the date one spouse filed for divorce, c) the date of the trial or hearing, or d) the date the divorce is final, if other than the trial date. Both the amount of monthly pension construed as "marital" and its present value depend on this date. In Wisconsin, the cutoff date is the trial date. If no trial date has been set, one may use "today's date." In practice, a date close to the expected trial date is often used. 2) The "Valuation Date." This is the date on which the present value of benefits is to be evaluated. In Wisconsin, the valuation date should be the same as the cutoff date, which should be the trial date or as close to it as possible. 3) The "Normal Retirement Age" (NRA). This term has a different meaning in divorce law than it does when used in pension plan documents. In a pension plan, NRA refers to a key retirement age used by the plan in defining its retirement benefits. It is the age at which the pension amount defined by the plan's benefit formula becomes payable with no adjustment made for "early" retirement. In divorce law, NRA means the age at which a pension appraiser should assume that a pension plan member will retire, for the purpose of valuing the member's retirement benefits. In Wisconsin, the NRA preferred by case law is "the earliest age at which the plan member could retire and receive unreduced benefits." Wisconsin's preferred NRA is usually the same as a plan's NRA, but it can be an earlier age in some situations. For example, if a plan defines its NRA to be age 65 but also states that members with 30 years of service may retire after age 60 with no reduction in benefits for early retirement, then the case law NRA for a plan member with 30.5 years of service on the cutoff date for his divorce would be age 60. The age as determined by the case law definition is usually a fair and reasonable retirement age for an expert to use, but a court may allow use of another age if evidence or testimony supports the opinion that the other age is likely to be closer to the person's true retirement age. Wisconsin's use of "the earliest age at which the plan member could retire and receive unreduced benefits" effectively prohibits the use of any early retirement age for the valuation of a pension, because early retirement benefits are always reductions of the plan's normal retirement benefit. Courts in 37 of 51 jurisdictions (the 50 states plus Washington, D.C.) use Wisconsin's definition of NRA. Seven jurisdictions define the NRA to be the earliest date at which the plan member "could retire and receive unreduced benefits assuming that the member continues in employment after the divorce." An interesting implication of the difference in these two definitions is that Wisconsin and 36 other jurisdictions avoid presuming any specific action on the part of the plan member after the divorce.Some pension experts doing valuations for Wisconsin divorces ignore the NRA definition favored by courts. This often results in gross inflation of the appraised values of accrued pensions. Bob's accrued normal retirement benefit is a $1,200 monthly pension, based on the assumption that he will retire at age 65. To value his pension, we assume retirement at age 65, a 4 percent interest rate, the UP-94 mortality table projected to 2012, 2.5 percent postretirement dividends, and a 20 percent effective income-tax rate. These assumptions are all considered reasonable by current standards. On this basis, the present value of Bob's after-tax accrued pension is $81,561. If we change only one variable, lowering Bob's assumed retirement age to 55, then his $1,200 accrued normal retirement pension falls to an $808.32 accrued early retirement pension, while the present value of the after-tax portion of this pension increases 46.4 percent to $119,426. If the court accepts this second valuation, then Bob's ex-wife will get a windfall of about $18,932 at Bob's expense – half of the difference between $119,426 and $81,561. Many pension experts do properly use the case law NRA for their valuations. However, some other experts assume that a plan member retires at the earliest possible age – which is always when a pension has its highest possible present value. They usually do this either without offering any justification for using the earliest retirement age or with a spurious explanation that the correct definition of "present value" requires that the largest of all possible present values be used. This notion about the proper meaning of present value seems to be fairly widespread, but it is incorrect. Present value is whatever it is, and it need not be the largest or the smallest of any set of possible present values. If indeed one were required to use the largest of several possible present values, this would have to be a matter of the law, not because of someone's interpretation of present value. The truth is that Wisconsin case law says to do the opposite of what these experts are doing: it says to assume retirement at "the earliest age at which the plan member could retire and receive unreduced benefits." This cannot possibly mean to assume that someone will retire early, because a pension plan's benefits are always reduced in cases of early retirement. Example 1 (see sidebar below) shows the error potentially introduced into pension valuations when early retirement is assumed instead of the case law NRA. Sometimes an expert may use an unusual retirement age, giving a reason for doing so. For example, testimony may affirm a plan member's intention to retire at a certain age, or an actuary's study of the retirement ages for a similar group of employees may indicate an average retirement age that differs significantly from the case law NRA. Some experts provide two valuations, one based on the case law NRA and the second on the earliest retirement age. This can be perplexing to a judge who would prefer that the expert simply provide a clear recommendation that conforms to the law. 4) The "Accrued Benefit" versus a Prorated "Projected Benefit." In Wisconsin, the accrued benefit at the cutoff date is used as the marital portion of a retirement account (in a defined contribution plan) or of a retirement annuity (in a defined benefit plan). A retirement plan member's accrued benefit at the cutoff date is the benefit amount earned by that date. It is equal to the amount of account balance or monthly benefit (whichever is relevant) the member would have if he or she quit work on the cutoff date. The member's projected benefit is an estimate of the member's account balance or monthly benefit (whichever is relevant) that will have accrued by the time the plan member retires if he or she continues in present employment until then. Some equitable distribution states define the marital benefit as a prorated portion of the projected benefit. Formula A, which applies a coverture fraction to the projected benefit, is used as the definition of the marital benefit in these states. In Wisconsin, Formula A is not used for finding a marital pension, but it can be useful for finding an appropriate percentage of an accrued pension or an appropriate amount of a plan member's defined contribution plan account to assign to the alternate payee under a QDRO. Under Wis. Stat. section 761.61(3), a court may decide to exempt from marital assets all or part of a pension that was already accrued at the time of marriage. In this case, one way to determine the portion of the accrued benefit that was earned before the marriage is to use the time rule, which requires the coverture-based Formula B (see sidebar on page 15). The alternative to the time rule is the tracing method. Under this method, the accrued benefit at the date of marriage is calculated directly from plan or other relevant information as of that date. This usually results in a smaller premarital accrued benefit than the time rule would give. The time rule treats all years of a pension plan member's service under a plan as being equally valuable for accruing pension, while the tracing method does not. Information about these two ways of allocating pensions is available on the Internet. Some Facts about the Projected Benefit and the Accrued Benefit. The projected benefit is a projected estimate based on assuming a) that the plan member will continue in employment after the divorce, b) the age at which the plan member will retire, c) the plan member's future compensation each year, d) the average rate at which the plan member will continue to accrue credited service until retirement, and e) that the plan will continue in its present form during that time. Finding the projected benefit under a defined contribution plan also requires assuming f) the rate of contributions to be added to the account in future years and g) the rate(s) of interest or investment earnings to be credited to the member's account during those years. Accrued benefit is defined in the Employee Retirement Income Security Act of 1974 (ERISA). With one notable exception, it is not necessary to use any assumptions for estimating an accrued benefit, as is done for a projected benefit. The exception is when it is necessary to know the amount of life annuity that an accrued defined contribution plan account will provide at some future retirement age. The balance of a defined contribution account accrued at the cutoff date can be found fairly closely, but estimating how much life annuity the account will eventually buy at retirement does require projecting the account by estimating its future interest earnings. Other than this exception, the accrued benefit can be accurately determined as of any date. Note that this exception is pertinent to valuations of WRS benefits. A plan member's accrued benefit is reported in an annual benefit statement, which each plan member receives shortly after the start of the plan's fiscal year. If a plan member has not saved the most recent benefit statement, the member or the member's attorney can contact the retirement plan administrator to find out about the accrued benefit. For large companies, this usually means contacting the personnel office, benefits office, or human resources department. The benefit statement may contain enough information to permit valuing the member's accrued benefit. However, often a benefit statement's date is not close to the cutoff date – it is often more than a year off. The correct thing to do is to use the benefit statement information as a basis for estimating the accrued benefit as of the cutoff date, when accrual of marital benefits actually ceases. Doing so can make a 10 percent or so difference in the value found for this marital asset and can affect the property distribution by thousands of dollars. In practice, many attorneys and their pension experts do not update the accrued benefit to the cutoff date. Lawyers should be aware that many pension plans count all or some of a member's military service as credited service. This is common with governmental plans such as the WRS. In many cases, the plan administrator will not ask whether a member has had military service until the member applies to retire. In such cases, the plan's annual benefit statement will not reflect any military service. The attorney should check whether the pension plan gives credit for military service and, if so, should find out whether the plan member has any military service that increases the accrued pension. 5) Whether to Consider Disability Benefits. In some states the present value of a retirement plan's disability benefits is included in marital assets. In Wisconsin, disability benefits from a pension plan are not considered marital assets. 6) Whether to Consider Preretirement Death Benefits. In Wisconsin, the jury may still be out on the question of whether the present value of a retirement plan's preretirement death benefits should be included in marital assets. None of approximately a dozen Wisconsin family lawyers asked was sure whether case law regards death benefits as marital property. Pension experts, too, seem to disagree about this, with many of them including a present value for the preretirement death benefit in their valuation reports, and many others leaving it out of their reports. Perhaps there is not yet enough case law to have decided this issue. Knowing some information about preretirement death benefits may help others who are wondering how to deal with this benefit. A preretirement death benefit protects spouses of vested pension plan members (those who have a nonforfeitable right in some percentage of their pensions). If a member dies before retiring, this benefit provides the beneficiary spouse with a life annuity based on the member's accrued benefit. Here is an argument for excluding the QPSA death benefit from marital assets. The SSA paragraph states, "These changes were designed primarily to improve pension protection for surviving spouses …." There is no mention of protection for ex-spouses. If taken literally, this seems to exclude death benefits from marital property. This is a benefit that will be paid only if the plan member dies before retirement, and Congress intended for it to protect the plan member's surviving spouse (or the beneficiary of record, if no spouse). This can hardly mean the ex-spouse. However, no issue has only one side, and some people think this benefit should be recognized as a marital asset. I exclude the QPSA benefit from valuations unless those requesting a valuation ask me to include it. To accurately find the present value of a preretirement death benefit requires a very complex calculation. Most experts who include it in their appraisals use a crude valuation method known as the "interest-only discounting method." This method usually overvalues the death benefit. The present value from this method is typically from one to three times as large as the benefit's actual present value. Most experts who use the interest-only method probably do not realize how inaccurate it can be. The present value of a QPSA benefit based on a given accrued pension is usually only 2 percent to 8 percent of the present value of the entire pension. For these two reasons – inaccurate appraisals and negligible present value – it seems reasonable to omit this benefit from divorce valuations unless an attorney or the court specifically asks for it to be included. Figure 1 shows how many states use each of the definitions of cutoff date, valuation date, and normal retirement age. This table identifies the definitions used by Wisconsin and its four neighboring states. Note that Wisconsin is the only community property state among these five, with Illinois, Iowa, Minnesota, and Michigan all being equitable-distribution states. There are two main types of retirement plans, defined contribution and defined benefit plans. Defined benefit plans often are called "pension plans" and the life annuities they pay to their retirees are called "pensions." Some retirement plans have both defined contribution and defined benefit features and are called "hybrid plans." The WRS is a hybrid plan. Defined Contribution Plans. These are savings or investment plans maintained by employers on behalf of their employees. A defined contribution plan keeps a separate account for each of its members, and the plan document defines how much money will be contributed each year to members' accounts. Each year a member's account grows with the addition of that year's contributions plus interest or investment earnings applied to the previous year's account value. When an employee retires, the amount in his or her account is either used by the plan to purchase a life annuity for the retiree or is paid to the retiree as a lump sum. Defined Benefit Plans or Pension Plans. These plans use a formula to define how much benefit each member receives as a life annuity or pension during retirement. Pensions are almost always paid on a monthly basis, and a pension's amount is expressed either as a monthly payment or as the annual total of its payments. Most defined benefit plans do not maintain accounts for their individual members but combine all plan assets in a single trust fund. The employer sponsoring the plan hires actuaries to do annual valuations of the plan to determine the amount of contribution the employer should make to the fund each year to properly fund the plan. A pension plan determines how much it will pay each member as follows: The plan specifies as its NRA a particular age at which the plan expects that its members will "normally" retire. This is often age 52 or 55 for police officers and firefighters and age 62 or 65 for other employees. A member who retires at this NRA receives as his or her pension an amount equal to the result of applying the plan's benefit formula to his or her amount of credited service and salary, hours of service under a bargaining agreement, or some other measure of employment. This formula benefit amount is called the member's normal retirement benefit (NRB). A Closer Look at Early Retirement. Some plans use ERFs that reduce the NRB for members who retire early to such a degree that the resulting ERBs have the same expected cost to the plan as these members' normal pensions would have had. In this case, the ERFs are said to be "actuarial" ERFs, and early retirement under the plan is said to be "actuarially fair" or unsubsidized. As far as the plan's costs are concerned, the employer is indifferent to whether employees retire early or not. Many plans use ERFs that are larger than actuarial ERFs. Early retirement pensions in these plans are more generous to retirees than the pensions they would receive if they retired at the "normal" age with a "normal" retirement benefit. It costs the employer sponsoring the plan more money when employees retire early, and so it is said that this employer subsidizes early retirement. Employers who want to encourage employees to retire early often do this by offering subsidized early retirement through their pension plans. However, even with this inducement, most employees cannot afford to give up their jobs and retire early. In times of a difficult economy many people put off retiring, and the percentage of early retirements taken declines during hard times. The Impact of Assuming Early Retirement Ages in Valuations. In Example 1, the present value of Bob's WRS pension that results from assuming Bob will retire early at age 55 is 46.4 percent higher than if one assumes he will retire at age 65. This is so because under the WRS, ERBs paid to men with 12 years of service include a 46.4 percent subsidy at age 55. Pension plans for public employees are created by politicians rather than by actuaries, and they often have much higher early retirement subsidies than private plans. The WRS is a good example of highly subsidized early retirement. About one in 12 Wisconsin workers is in the WRS, and so family lawyers have many cases that involve WRS pensions. They need to understand the WRS early retirement subsidy, and be alert to pension experts whose insistence on assuming early retirement grossly inflates their WRS pension valuations. Possible QDRO Issues. Some plans have provisions that allow long-serving employees to elect to take advantage of special subsidized ERBs. This can create an issue regarding the right of an alternate payee under a QDRO to share in the subsidy portion of such a benefit if the plan member does elect it. Those who design QDROs should anticipate such possibilities and address them in the QDRO. Also, a plan sponsor can amend a plan after the date of divorce in some way that creates a situation that in ex post facto fashion unexpectedly increases the value of the member's benefit resulting from marital years of credited service. It is hoped that QDRO drafters will foresee this possibility and include appropriate provisions in the QDRO to indicate whether the alternate payee will share in the benefit increase created by such an amendment. Postretirement Adjustments to Pensions. Some defined benefit plans give cost-of-living adjustments (COLAs) as pension increases to their retirees. COLAs can be defined as stated percentages, as some fraction of the consumer price index (CPI), or in other ways. If a plan has any guaranteed way of changing a pension after retirement, this should be reflected in the pension's valuation. The WRS makes postretirement "dividend adjustments" to retiree benefits. These act like a COLA and are valued like a COLA. Adjustments to retirees' pensions in any year are based on economic and demographic experience of the WRS in the prior year. The rate of adjustment can be positive or negative. The WRS had never had a negative dividend adjustment until 2008 (although it was zero in 2002), but now dividends have been negative for four years in a row, including a -7 percent dividend recently announced for 2011. However, even if some years' negative dividends may reduce a retiree's pension, under state law a retiree will never receive less than the original pension. Definitions of Accrued Benefit. The concept of accrued benefit was originally defined in ERISA. A plan member's accrued benefit is defined as follows for defined contribution and defined benefit plans. 1) Defined Contribution Plans. For a member of a defined contribution plan, the usual accrued benefit at any date is the value of the member's plan account on that date. If at that time any interest, contributions, or payouts are accrued but not yet credited to the account, these accrued amounts are added to the account balance to determine the accrued benefit. However, if the plan will use the money in the account to provide the member with a life annuity starting at some future retirement age, then for some purposes (for example, valuations of WRS benefits), the accrued benefit must be expressed as the monthly or annual amount of that annuity rather than as the sum used to provide the annuity. To find the amount of life annuity that an accrued defined contribution plan account will provide at a future retirement age, the account's accrued balance is projected to the date of retirement by applying future interest earnings to the account, assuming reasonable future interest rates. FAE mid-2012 = 1.015 x $6,158 = $6,250 per month. AB 65 = Accrued Normal Retirement Benefit mid-2012 = .016 x $6,250 x 12.0 = $1,200 per month. AB 55 = Accrued Early Retirement Benefit mid-2012 = 0.6736 x $1,200 = $808.32 per month. These are the benefit amounts for retirement ages 65 and 55 that are used in Example 1. The importance of updating the accrued benefit: If Bob's accrued benefit was not updated from the Jan. 1, 2012 statement date to the June 29, 2012 cutoff date, the pension value would be only $1,133 per month instead of $1,200 per month, resulting in a present value of $77,007 instead of the more correct $81,561 reported in Example 1. This is a relative difference of 5.9 percent. In dollar terms this means a $4,554 difference in the after-tax present value of marital benefits. Half of this is the dollar impact on each of Bob and his spouse. Bob would get a $2,277 windfall at the expense of his ex-wife because of the failure to update the accrued benefit. 2) Defined Benefit Plans (Pension Plans). Determining the accrued benefit under a defined benefit plan is demonstrated in Example 2. Use this method to find a pension plan member's accrued benefit at any date. First use the plan's benefit formula with the values of credited service, final average salary, or other formula elements as they are on that date to find the member's NRB. This amount is the member's accrued NRB or "accrued benefit at age [65 or whatever the normal retirement age is]." If the retirement age is assumed to be earlier than the plan's NRA, reduce the accrued NRB to compensate for the longer expected benefit payout of earlier retirement, by multiplying the accrued NRB by an early retirement factor that is some fraction less than 1.00. The ERF will either be listed or described in the plan document. The result is the "accrued benefit at age [55 or whatever the early retirement age is]." Valuation Methods. All pension experts use one of two general methods for calculating present values of life annuities: an actuarial method or some version of the life expectancy method. Actuarial methods produce accurate present values of life annuities, and life expectancy methods produce fairly close estimates of the present values of life annuities. A mortality table is a set of annual rates of death for every year of age within a suitable age range, usually ending at age 120. An actuarial method uses a mortality table to calculate the present value of a life annuity in this way. For every month of age to which a pensioner may possibly live, one calculates the present value of that month's pension payment by 1) applying interest discounting to the payment to find its present value today, and then 2) multiplying that result by the probability that the pensioner will live long enough to receive that payment. (This probability is based on the mortality table.) The result is the actuarial present value of that one pension payment. The total of the present values of all possible payments equals the actuarial present value of the pension. A single use of an actuarial method may require 300 or more basic calculations. Most experts show only the main results in their reports. Most economists, accountants, attorneys, and other nonactuaries who appraise life annuities do not do actuarial calculations but use a simpler method called the life expectancy method. This method gives an estimated present value that is always a few percentage points higher than the accurate present value found by an actuarial method. To use the life expectancy method, one must know the amount of monthly accrued pension and the life expectancy of a plan member when he or she retires – this is the person's average remaining future lifetime. One must also know how to calculate the present value of a monthly annuity certain, a set of monthly payments that are certain to be paid during some time period, regardless of anyone living or dying. Any financial calculator can do this calculation. A pension appraiser using the life expectancy method is treating the pension as if it were payable as an annuity certain during the life expectancy period of the person receiving it, rather than as a life annuity payable until the person actually dies. The resulting present value of this annuity certain is up to 6 percent higher than the true present value of the life annuity, but it is much easier to calculate than the life annuity. This amount of error in the estimate, while not desirable, is considered small enough for the estimated present value to be used in divorce cases. Valuation Assumptions. Five assumptions are used for calculating a pension's present value. 1) A plan member's assumed retirement age. As shown above, early retirement subsidies in a pension plan can result in gross overestimates of pension present values if we assume early retirement instead of normal retirement. The case law NRA should be used unless there is good reason to assume another age. 2) Income tax rate. In Wisconsin, it is common practice to assume 20 percent total income tax applicable to future pension payments (15 percent federal and 5 percent state). It is reasonable to use a different tax rate in a specific case if there is evidence in favor of the other rate's future applicability. Until recently, this has seldom been done, but now it is becoming more common practice to assume other than a 20 percent tax rate. Statistics reported by the Congressional Budget Office concerning average marginal income tax rates paid by different age groups are sometimes given in support of using a different rate. 3) Interest rate. An interest rate is used to discount future amounts to the present. Ideally, it should be a rate at which the pension's present value could reasonably be invested as a lump sum at the present time, which would then grow under that rate (at compound interest) until at the time of expected retirement it had become an amount sufficient to finance a pension similar in amount and conditions of payment to the pension being valued. There are two separate time periods for which future benefit payments must be discounted. The time from the cutoff date to the assumed retirement date is the deferral period, and the time following retirement is the payout period. Some pension appraisers use a different interest rate during each of these periods. 4) Mortality table. Most pension experts downplay the importance of which mortality table is used for pension appraisals. In my opinion, this is a mistake because different tables reflect the mortality of different groups of people, and they give significantly different valuations. Before 1994, the "1983 Group Annuity" mortality table was used for pension calculations. Since then two excellent mortality tables have been developed from pension plan data specifically for members of pension plans: the 1994 Uninsured Pensioner or "UP-94" table, and the "RP-2000" table. The Society of Actuaries (SoA) developed the UP-94 table in 1994. With this table the SoA also provided mortality improvement factors to project UP-94 mortality rates beyond 1994 to recognize future mortality improvements because of advances in medicine, public hygiene, and so on. Bob's pension in Example 1 was valued using UP-94 mortality projected to year 2012, with 4 percent interest and 2.5 percent dividends. The resulting present value of Bob's pension is $81,561. The other mortality table worth noting is the RP-2000 table, which is actually a set of several related tables. The data used to develop these tables is as recent as the UP-94 data, and RP-2000 uses the same projection of mortality improvements. RP-2000 also provides a way to vary mortality rates to reflect blue-collar versus white-collar professions, which have significantly different mortality rates. There are separate RP-2000 tables for active employees, healthy retirees, actives and retirees combined, and disabled retirees. Bob's pension using the RP-2000 (combined) table updated to 2012 has a present value of $81,787 – within 0.3 percent of the UP-94 value. Either of these two mortality tables is a good choice for valuing pensions in divorce cases. Experts who use the life expectancy method usually use U.S. Life mortality tables. The U.S. Department of Health and Human Services develops these tables from vital statistics for the entire U.S. population. Many experts use the U.S. Life tables because it is easy to find tables of life expectancies based on them. However, the life expectancy of an American pension plan member is significantly different from that of an average American. For example, the life expectancy of a 65-year-old white man is 17.09 years based on the 2006 U.S. Life table but 18.77 years based on UP-94 updated to 2012, and 18.56 years based on RP-2000 updated to 2012. Modern pension tables expect a 65-year-old white man to live about 1.5 years longer than the U.S. Life table expects him to. Present values of pensions based on the two types of tables differ to a similar degree. If in Example 1 we use the 2006 U.S. Life Table instead of UP-94 updated to 2012 to appraise Bob's accrued pension, the value of his benefit drops to $73, 558. This is 10% less than the more appropriate value. This much difference would give Bob a $4,002 windfall at the expense of his ex-wife. Actuarial Standard of Practice No. 34. The document "Actuarial Practice Concerning Retirement Plan Benefits in Domestic Relations Actions" (ASOP 34) offers the best guidance of the actuarial profession on the matter of selecting appropriate methods and rates for valuation of pensions in divorce cases, and also regarding the expert's responsibility in such cases. Many pension experts fail to adhere to ASOP 34 when choosing their assumptions for valuations. Most of them are not actuaries and may not know of this guideline's existence. ASOP 34 is available at www.actuarialstandardsboard.org/pdf/asops/asop034_151.pdf. Sensitivity of Present Values to the Assumptions Used for Valuation. Example 1 shows how sensitive the present value of a pension can be to the retirement age assumed for valuation. This happens for plans that subsidize early retirement, which many plans do to some degree. One can avoid this problem simply by respecting the wisdom of Wisconsin's case law when choosing the retirement age assumption. Use the law's preferred NRA, that is, "the earliest age at which the plan member could retire and receive unreduced benefits." The present value of a pension also is sensitive to the interest rate used for discounting. For plans like the WRS that use dividends or COLAs to adjust retirees' pensions, the present value also is sensitive to the assumed future rate(s) of those increases. Figure 2 shows this by comparing valuations made using different interest and COLA or dividend rates. ASOP 34's Recommendations Regarding Interest Rates. For many experts, interest rates are the most difficult assumption to select for a valuation. ASOP 34 approves the use of interest rates close to the current yield rates of some common low-risk securities, which gives practitioners some (but not much) latitude in their choice of a valuation interest rate. This includes yields on U.S. Treasury bonds as well as a published index reflecting yield rates for high-quality corporate bonds. Following this guideline, many experts base their interest rate on recent yields for either 20- or 30-year U.S. Treasury bonds or high-grade corporate bonds with Moody's Aaa or Baa ratings. The Federal Reserve publishes these rates at www.federalreserve.gov/releases/h15/. In Section 3.3.3(c), ASOP 34 provides another way to select an interest rate: "As an alternative to selecting a discount rate under section (a), and a mortality assumption under section (b), the actuary may assume the cost of the purchase of an immediate or deferred annuity contract, as appropriate, from an insurance carrier. Typically, this may be done by using an actual insurance survey or by reference to published tables that are derived from such surveys." This approach makes sense if one agrees that the present value placed on a pension should be equal to the cost of a similar pension that can be purchased today to replace it. After all, if a divorced person were to use money received in settlement of pension rights to buy a replacement life annuity, he or she would very likely use it to buy an insured annuity rather than buying long-term U.S. Treasury bonds or high-quality corporate bonds and then trading them or holding them to maturity. For this to be of practical use, one needs to know what interest rates insurance companies are using to price life annuities. This information is readily available. Each quarter, the Pension Benefit Guaranty Corporation (PBGC) surveys interest rates used by insurance companies for pricing life annuities. The PBGC uses these interest rates with UP-94 mortality projected for 10 years to reflect current pricing of insured life annuities. The PBGC interest rates are available at http://www.pbgc.gov/prac/interest/ida.html. The PBGC provides a pair of interest rates for each quarter. By converting each pair of rates into a single equivalent rate that produces the same cost for an annuity sold to a particular person, one obtains a single rate that agrees with insurance company pricing and can be used for valuing that person's pension for a divorce case. Figure 3 lists the average yield rates for 30-year U.S. Treasury Bonds and for low-risk corporate bonds rated Aaa by Moody's. It also shows a single rate that is the equivalent of the paired rates published by the PBGC to price insured life annuities. Each of these three interest rates is shown at six-month intervals since mid-2006. The Figure 3 chart shows that all three rates are subject to extreme short-term volatility. This is obviously an undesirable trait for any valuation assumption. It is possible, though, to apply an averaging process to any of these rates to get a derived rate that fluctuates much less from month to month than the original rates do. This "smoothed" version of the original series of rates can be used as a more stable valuation interest rate. For instance, one could use a 12-month moving average of corporate bond rates, or an exponential moving average of PBGC rates. This type of derived rate is close to the original series of rates but is much more stable over short periods. If based on one of the three standard types of rates shown in Figure 3, such an averaged rate has the approval of ASOP 34, and it does not have the undesirable property of erratic short-term volatility that plagues all three of these rates mentioned in ASOP 34. Recent Retirement Ages. Figure 4 shows average retirement ages of WRS participants during each three-year period covered by its last two "experience studies." These studies show that the average retirement ages for every category of WRS employee are much higher than the earliest retirement ages permitted under the WRS, and that the average retirement age for all employees increased substantially during the period 2004 – 2007 (the midyears of the two studies). This gives empirical support to use of the NRA preferred by Wisconsin's case law for valuing pensions. 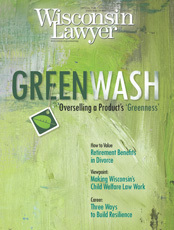 Descriptions of the WRS benefit structure and QDRO rules appear in an article3 in the October 2006 Wisconsin Lawyer, and so it is not necessary to describe the WRS in detail here. This section concludes this article with three observations about the WRS. 1) Declining Dividends. As mentioned earlier, the WRS had never given a negative postretirement dividend adjustment until 2008 (although 2002 had a zero dividend). However, dividend adjustments have now been negative for four consecutive years. This includes a -7 percent dividend for 2011 that was announced in March 2012. Table Div-65 in Figure 2 shows how sensitive the valuation of a WRS pension is to the level of future dividend rates assumed by an appraiser. Therefore, pension experts should use as realistic a dividend rate assumption as possible for WRS valuations. Section 3.3.3 of ASOP 34 states that "Each assumption selected by the actuary should be individually reasonable and consistent with every other assumption selected by the actuary. The actuary should be prepared to justify each assumption selected." Many pension experts have recently been assuming an approximately 2.5 percent future dividend rate for WRS valuations. I formerly assumed a 2.67 percent dividend rate, which is the rate the WRS actuaries assume for their WRS valuations. Now I believe this is unreasonably high. Figure 5 shows why. 2) Valuing the WRS "Money Purchase Benefit." As stated earlier, a pension plan member's accrued benefit as of a divorce cutoff date is the amount of monthly benefit the member would have if he or she quit work on that date. This is also the member's "marital benefit" under Wisconsin case law. In discussing Wisconsin's definition of NRB, it was also observed that "Wisconsin and 36 other jurisdictions avoid presuming any specific action on the part of the plan member after the divorce." These observations are consistent with each other in the case of a WRS member's accrued formula benefit. If a member quits his job on the cutoff date, then his formula benefit accrued as of that date remains unchanged thereafter until he claims it by retiring. In this case, the state's use of the accrued benefit as the definition of the marital pension seems consistent with its reluctance to assume that a plan member will continue working after a divorce – because if he does not continue to work, then the accrued benefit is in fact what he will get at retirement. A WRS member's money purchase account (and the life annuity it will buy) continues to increase after the cutoff date, regardless of whether the member continues to work. After the cutoff date, the money purchase benefit continues to increase with annual compounding of interest. This is one of the main issues in Bloomer v. Bloomer, a 1978 Wisconsin Supreme Court case.4 The Bloomer decision provided guidance for valuing money purchase benefits under the WRS. The opinion implies that one should project the WRS money purchase account as of the cutoff date in a realistic manner to the time of expected retirement, convert it at that time to a monthly annuity by using the WRS money purchase rates, and then value that life annuity as the WRS accrued pension if it is larger than the WRS formula benefit that is also accrued at the cutoff date and would be payable at that same retirement age. One then determines the present value of whichever of these two accrued benefits is found to be larger at the time of retirement, the money purchase benefit or formula benefit, because that is the pension the WRS would pay the retiree. In Bloomer, a simple scenario is described wherein the rate at which the money purchase account continues to grow is assumed to equal the interest discounting rate used for valuing the resulting pension. These two rates therefore exactly cancel each other out, with the same effect as if the account did not continue to grow, but neither was the value of its resulting pension discounted during the period between the divorce date and assumed retirement age. Although this illustration used in the Bloomer opinion has been simplified, the principles that are explained in this important decision seem quite clear, and I believe I have correctly explained its full implication for WRS valuations in the preceding paragraph. 3) Outlook for the WRS Money Purchase Plan. From 1982 through 1999 the interest rate credited each year to employees' WRS money purchase accounts was capped at 5 percent. There was no possibility of a member's money purchase account earning more than 5 percent in any year. However, 1999 Wisconsin Act 11 amended the WRS so that now money purchase accounts receive as interest the effective rate of return on investments that the trust fund has earned in the previous year. Unfortunately, the trend since year 2000 shown in Figure 5 for dividends is similar to the trend over this same period of the effective rate of investment return of that portion of the trust fund that determines how much interest will be credited to members' money purchase accounts. The Department of Employee Trust Funds recently announced that this rate of investment return for 2011 was only 1.5 percent. Since 2000 this key rate has had an average annual decline of -0.5 percent per year, based on a similar Median-Median trend line as the one used in Figure 5 for dividends. This is a very low return on assets for the WRS, for which the plan's actuaries officially expect at least a 7.8 percent average return over the long run. It appears that the rate of return, like the rate of dividends, may get worse before it gets better. Scott Dennison has been a mathematician, pension researcher, and consulting actuary for 38 years. In 1991-97 he was West Virginia's State Actuary, and during 1997-99 he served as Wisconsin's Retirement Research Director. Since 2000 he has provided Wisconsin attorneys with present value calculations and vocational projections for use in divorce, personal injury, wrongful death, worker's compensation, and other cases. Contact him at com sd-actuary mchsi mchsi sd-actuary com or (608) 847-5276. This article has reviewed Wisconsin law regarding division of retirement benefits, discussed the nature of typical retirement plans, looked at the impact of actuarial assumptions on benefit valuations, and provided detailed examples (at www.wisbar.org/retirementbenefits) to show how this applies to valuations of WRS benefits. All the information here begs the question: How far can or should attorneys and their experts go in trying to make our methods and assumptions realistic for valuing pensions in divorce cases? If valuation methods are not realistic, the resulting appraisal may not be realistic or fair to divorcing individuals who believe their important assets will be valued correctly. Dividing pensions fairly between divorcing spouses has become quite a challenge. 1 Bloomer v. Bloomer, 84 Wis. 2d 124, 267 N.W.2d 235 (1978). 2 Social Security Bulletin, Vol. 48, No. 5, at 38-44 (May 1985), available at www.ssa.gov/policy/docs/ssb/v48n5/v48n5p38.pdf. 3 Scott L. Dennison, "Dividing Wisconsin Retirement System Benefits," 79 Wis. Law. 12 (Oct. 2006). 4 Bloomer, 84 Wis. 2d 124.